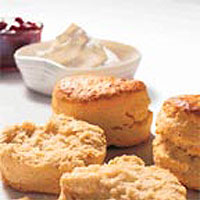 Scones are very simple and quick to make using store cupboard ingredients. You can have a batch of warm scones on the table within half an hour. Preheat the oven to 200°C, gas mark 6. Sift the flour into a mixing bowl. Cut the butter into small squares and add it to the flour. Mix the butter into the flour until all the pieces are coated, then rub in, using your fingertips, until the mixture resembles fine breadcrumbs. Lift the mixture to incorporate air and keep it light. Stir in the sugar. Pour in the milk and mix with a round-bladed knife to make a soft dough. When the mixture forms a rough ball, put on a work surface that has been lightly dusted with flour. Knead the dough briefly to smooth out the cracks, taking care not to overwork it or your scones will not rise so well. Press or roll out to 1.5cm thickness and cut into rounds with a 6cm pastry cutter. Gather up the scraps of dough, knead briefly, roll out again and cut out further scones. Transfer the scones, spacing them a little apart, to the baking sheet. Bake for 10-12 minutes, until they are risen and golden brown. Transfer to a cooling rack and leave to cool. Serve warm or cold. Split the scones, spread with butter and Waitrose Soft Continental Strawberry Conserve and top with clotted or whipped double cream. This recipe will give a lovely crusty top to the scones. If you like a light shine, brush with a little milk and sprinkle with caster sugar. For a rich glaze brush the tops with a little beaten egg. Buttermilk - replace the milk with 175g buttermilk for an even lighter texture and slightly sweeter flavour. Stir in 50-75g dried fruit of your choice (try chopped apricots or mango) and 1 tsp ground cinnamon with the sugar. Omit the sugar and stir in 75g grated mature Cheddar instead. Add 1 tsp mustard with the milk. Brush the tops of the scones with milk and sprinkle with a little more grated cheese before baking. Replace half the flour with self raising wholemeal flour. You may need an extra tablespoon of milk for mixing. Use light muscovado sugar instead of caster sugar.